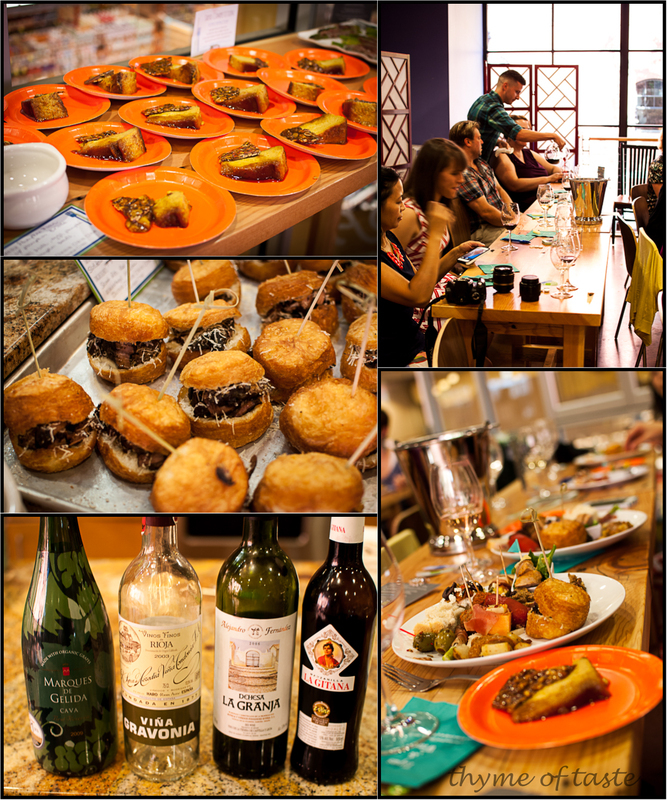 Last weekend I had the most awesome opportunity to enter a tapas competition with the PDX food bloggers. This was the first time I’ve ever entered a food competition and let’s just say I was really nervous! I knew I wanted to do a dessert…I am the baker of thyme after all. Andrew suggested a pumpkin flan. 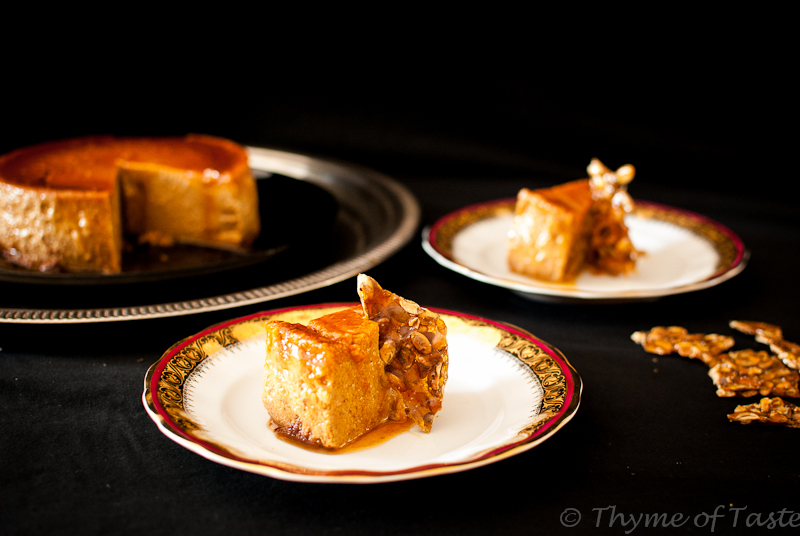 Oh my…I love pumpkin and a flan is always fun to make! I kicked it up a notch with a pumpkin brittle to serve on the side. 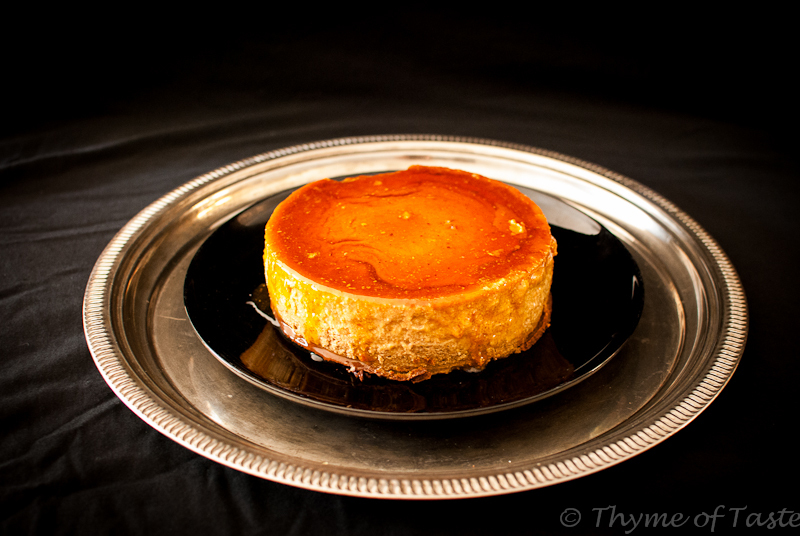 I finally found the one…adapted from Epicurious…I decided to do this pumpkin flan. The pumpkin seed brittle alone is like crack! Soooo good, it melts in your mouth with a hint of sea salt…. Andrew already knew what he was going to make, a cronut with a braised beef short ribs cooked in red wine. It was all kinds of wrong but so right in many ways. Savory and melt in your mouth goodness topped with manchego cheese….oh my gawd…I think everyone loved these little sandwiches! ( recipe will post soon). A cronut= a croissant+ a donut….yes the crazy craze that has hit NY lately, Andrew decided to make his own version of the cronut! We met so many nice peeps in our home town, this event held at Whole Foods in the Pearl district, was totally fun! So many great cooks in one event. It was very hard to vote for the best dishes, I think everyone is a winner in my opinion. We tasted everything from potatoes, crostinis, meatballs, pineapple stuffed jalapenos and olives….along side with some spanish wine tasting, made this event totally awesome! Andrew and I love wine, it’s no secret, it is a staple in our house, and Spanish wine we have had many times. But a Spanish white? This was new to us…I loved the Cava…smooth and refreshing on a warm summer’s day, I could get use to having this one around. After the wine tasting, we got to taste all the tapas, and Bee from the Spicy Bee gave us a little history lesson on where tapas came from. I had no idea it meant “to cover your food”! Ha, who knew! I thought it meant small plates and lots of wine, LOL! We had a great time over all, and when they announced my pumpkin flan was the 1st place winner, I was shocked! The first time in a food competition and I won….it was amazing! 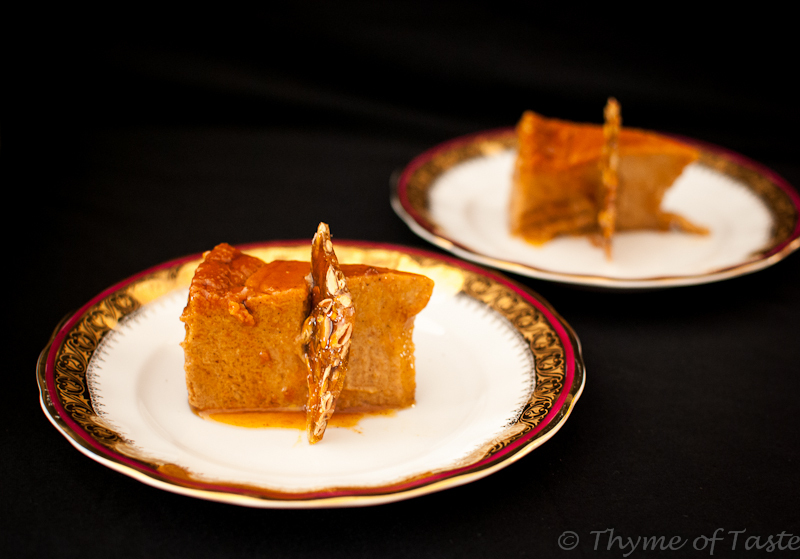 So here is my prize winning pumpkin flan, adapted from epicurious…I made a few changes to the original recipe. Cheers, I hope you all enjoy! Cook 1 C of sugar in a medium non stick saucepan over low heat until golden brown. Swirling the pan until light in color. Pour into heated souffle dish, swirling and coating the bottom and sides until cooled and pan is coated. Scald whole milk and evaporated milk in a small saucepan. Beat eggs and 1 C of sugar in mixer on medium speed. Add pumpkin, salt, tequila, and spices and mix until combined. Pour milk mixture through a sieve and add to pumpkin mixture, mix on low until combined. Now pour mixture into the souffle dish. Set dish into a water bath with 1 inch of water and lower oven to 350 degrees. Bake for 2 hours, until knife inserted comes out clean. Chill flan for 8 hours or overnight in souffle dish. To plate flan, run a thin knife around the edge and wiggle dish, place a plate on top and flip upside down, slowly lifting souffle dish. Swirl 2 C of sugar in a medium pan over low heat until melted. In a separate pan, roast the pumpkin seeds over medium heat until brown. Add the seeds to the carmel and mix together. On a baking sheet lined with parchment paper, spread the seeds/sugar mixture until thin. Break into pieces and serve with flan.